Designed to offer continuous, reliable and heavy-duty services, Superior gas engines require low fuel consumption while boosting workplace efficiency. Extended service life, alongside a constantly updated design, ensure top quality results when a Superior engine is utilized. Superior gas engines, often outfitted with the brand’s reciprocating compressor portfolio, achieve high horsepower and speed while minimizing emissions. An additionally high service life, surpassing many marketplace contenders, results in year-to-year success with a single installation. 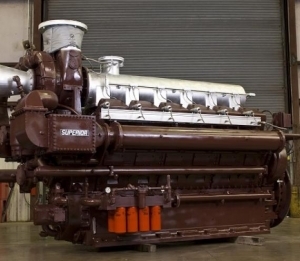 Superior gas engines are available in both 12- and 16-cylinder models. Each robust engine has been designed, from the ground up, to innovate natural gas consumption. Superior gas engines, capable of running on dirty gas, optimize air and fuel mixing alongside timed fuel injections. The result is minimized consumption requirements and incredible workplace flexibility. Each Superior product’s low-compression pistons similarly reduce dynamic stress, ensuring reliable, stable operation. Ironline Compression is proud to support Superior parts and services, assisting engine operators, every step of the way, with maintenance, care and success. Superior engines are incomparable machine workhorses, and each deserves high-quality treatment and options. Sourced conveniently, and from attentive sources, Superior engines guarantee success in efficient, high-powered environments for many, many years. Superior is now part of the GE Oil and Gas product family. For detailed Superior Engine Product Overview, click here. Or for a detailed Compressor Product Overview, click here.